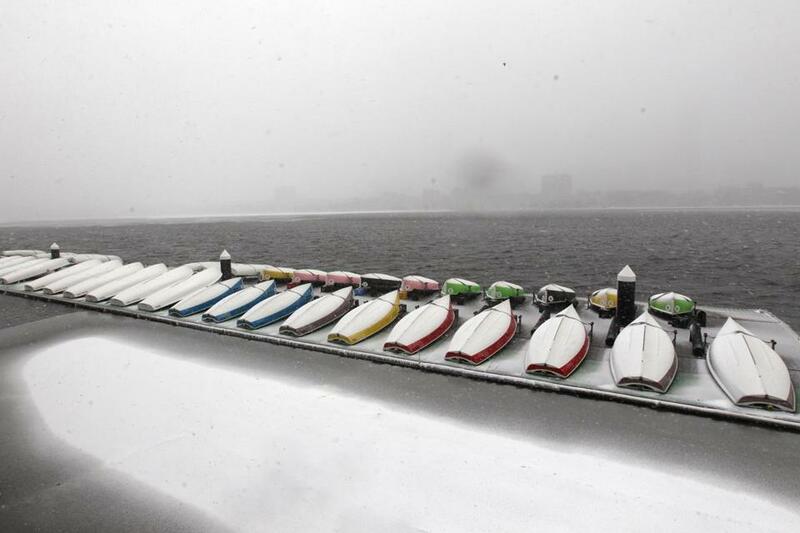 Under lowering skies, boats were lined up at the Massachusetts Institute of Technology’s sailing pavilion on the Charles. Forecasters said Friday night the storm remained on track to produce prodigious amounts of snow. But, in many ways, it reflects an utterly typical winter weather pattern, meteorologists said. Its path just happens to be dead-on, landing at a meteorological sweet spot to produce substantial snowfall in New England. The jet stream that flows from west to east, 18,000 feet above the surface of the Earth, has two branches: a polar stream that takes a northerly route and a second, more southerly stream. When those branches converge, which is a pretty routine event during winter, snow is a possibility, as the frigid air from the north mingles with the humid air from the south. “This winter has been interesting because the two streams have been largely separate,” Franck said. This time, separate storms were brewing in each branch of the jet stream. The storm in the northern branch had deposited light snow in the upper Midwest. The storm in the southern branch had spawned rain in the mid-Atlantic, Franck said. They separately swept toward New England, and by Friday night, meteorologists were saying the storms appeared destined to combine — very near a spot meteorologists call the “benchmark” because it is a pivotal spot for understanding how storms are likely to behave. “The intersection point where the storms will ultimately become one . . . just south of Block Island, in that area — that’s just the perfect location,” said David Epstein, a meteorologist whose forecasts appear on Boston.com. Franck said all projections of the trajectory of the two jet stream branches and their attendant storms, and where they were poised to merge, suggested the development of a “prolific snow producer.” By early evening, nearly 7 inches of snow had fallen in some areas of Boston, but forecasters predicted the pace of snowfall would accelerate as the night deepened. If the storms had met to the northwest of the benchmark, a mix of snow and rain would have resulted. If they had merged to the southeast, the resulting precipitation would have been less substantial. But the storms appeared to be following a track that would place them over the meteorological benchmark. Once they meet, they can spark what is called an “explosive deepening.” Barometric pressure then plunges, potentially enough to light the fuse on a meteorological bomb. The low pressure ­area causes winds to gust — winds that were expected to sharply intensify. In areas of low pressure, the air rises, cools, and condenses, forming clouds and precipitation. The storm was expected to slow a little between midnight and noon Saturday, lingering near the benchmark. The snow is expected to taper off Saturday afternoon as the storm heads toward Newfoundland, leaving people across the state to dig out.